The good news is that help is at hand. If you are just about to make your first investment then read on – this guide is for you. 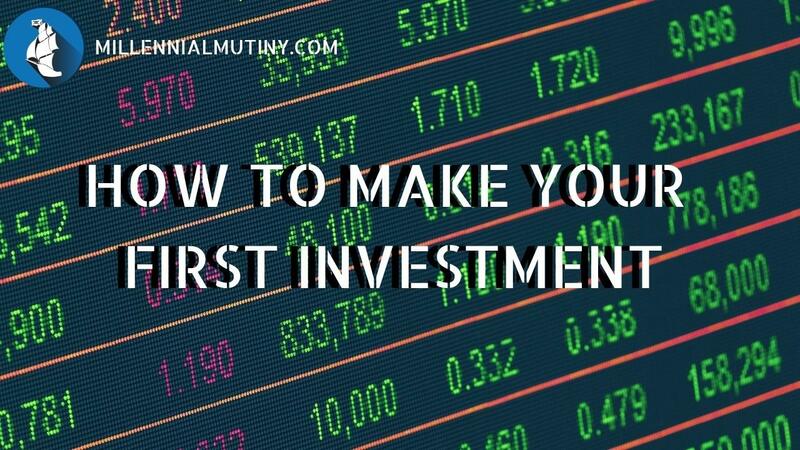 There are so many questions that I get asked by investing first-timers, I thought I would put all of them together into a Q&A and then finish off with a quick an easy way for you to start investing for the first time. The simple answer to this question is – as much as you can afford! The more you save and invest now, the faster you can reach Financial Independence. Investing a lot of money is easier said than done and in most cases, I suggest you start small and then build up as time goes on. Investing for the first time can be scary and you could make some mistakes along the way. I invest for a living and I made some really silly mistakes when I first got started, before I had the knowledge and experience I have now. The good news is that I am going to make it super simple for you to get started and you should be able to avoid most of the mistakes I have made so you should find success much faster. Many online brokers will now allow you to get started with investing for as little as $25 per month. I suggest you pay yourself first and set up a regular debit from your bank account each month into your investment account so that your investing is on auto-pilot. If you are currently in debt, you may want to consider paying this off first before you start investing a lot of money. Head on over to this post to check out how you can pay off your debts super fast. If you are free of debt (apart from responsibly used good debt), but you are struggling to find any extra money to save, check out this post to help you earn an extra $20 today and then every day. Again, the simple answer is – as often as you can! The more thoughtful answer though is probably to start off with a regular, monthly investment. Not only does this make it super easy to ‘pay yourself first’, it also means that your investing is automatic and you don’t have to think about it each month. By automating your investing like this, you avoid the temptation of spending any spare cash you have left over and running out of money to invest at the end of the month. I suggest that your investment payment is one of the first (preferably the first) payments that leave your bank account each month. This way, your investing is already taken care of as soon as you have been paid. This is what it means to pay yourself first. If you invest on a regular basis, you also benefit from a phenomenon called ‘dollar cost averaging’. So What Is Dollar Cost Averaging? Dollar cost averaging is one of your best friends when it comes to investing over the long term, especially if you don't have a lump sum to invest and want to invest regularly. When you are benefiting from dollar cost averaging, you win even when the stock market falls. How can that work!?! Let’s say that you are planning on investing $30 and you have a choice – do you invest all $30 on day 1 or do you invest $10 per month over 3 months. Now let’s assume that on day 1, you can buy a share in ABC Corp for $1 (this is a super simple example, but it does illustrate the point). If we invest all of our $30 on day 1, we get 30 shares in ABC Corp.
Now let’s say that instead of investing all of the money on day 1, we only invest $10 on day one, buying us 10 shares. In month 2, when we go to make our investment, the share price of ABC Corp has fallen to $0.50. This means that we get 20 shares for our $10 investment. In month 3, the share price has gone up to $2 a share. This means in month 3, we can buy 5 shares with our $10 payment. In the first example, we now have 30 shares in total, which at $2 a share are worth $60. In the second example however, where we have benefited from dollar cost averaging, we now have 35 shares for a total value of $70 – a full $10 more! Do you see how we benefited when the share price fell in month 2 – we were able to buy 20 shares rather than just 10 like in month 1? Of course this is a super simple example, but it illustrates the point well. Because we bought more shares when the share price fell, we now have more shares to benefit from the price rise that happens in the following month. In reality, the effect of dollar cost averaging will probably take a lot longer to become clear, but it is a clear advantage of investing regularly. Nowadays, when the market falls, I have a little smile inside because I know my monthly investments are purchasing more shares, which will rise in future years. So Who Should I Invest With? Ok, so we know how much we should be investing and how often. The next decision for most people will be to select a broker to work with or an online investment platform to use. If you are just starting out on your investing journey, I suggest you keep it super simple. If you are in the US, you can purchase low-cost investments from Vanguard, or you could choose to use the investing service from Personal Capital (although you can, and should, use their brilliant wealth and spending tracking tools for free with no requirements to use their investments). In the UK, Vanguard also now offers a low-cost investment service or you could use a user friendly platform service like AJ Bell You-Invest or Hargreaves Lansdown. When it all boils down, the fact that you are investing will be more important that who you invest with. I suggest you use a provider who makes sense to you (if the system you select is user-friendly for you, you are far more likely to use it regularly), and also keep an eye on costs. Every dollar counts! And Finally, What Should I Invest In? This is probably the hardest investment question of all – what on earth should you invest in for your first investment. In the investment world, there are literally millions of different funds and products competing for your attention and your money. The good news is this – when you are investing for the first time, you can ignore almost all of them. For people who are new to investing, I always recommend you use what is known as a multi-asset fund. This means that the fund manager does all of the stock and asset selections and you can just sit back and watch. Vanguard have a range of low-cost funds that they call Lifestrategy, which do exactly this job. This means you can buy a single fund and have a globally diversified investment portfolio in a matter of seconds – pretty neat huh? There are plenty of other providers that do this job as well, but the Vanguard funds are very well priced and have a good performance track record – need I say more? You have just made your very first investment – wasn’t so hard was it? The only thing to remember when investing is that we are investing for many, many years and not just a matter of days or months. Once we have made the first investment, it is very tempting to check it every 5 minutes on our smartphone and see how things are doing. There is also the temptation to chop and change your funds every few months if things don’t perform as planned. Studies have shown that doing these things will actually do you more harm than good. Although it may not be that exciting (to be honest, I don’t really want my investments to be exciting), the best thing to do is often just to do nothing. I hope you have success on your investing journey – let me know how you get along.